Seiko is a watch brand that’s been around for 125 years, pioneering some of the greatest innovations in modern watchmaking. The Seiko Sportura is a sleek, water-resistant, analog display watch that carries on the Seiko spirit of quality and smart design. One of the best features about the Seiko Sportura is its chronographic capabilities. If you’re unfamiliar with the term, it basically means that it has an independent hand that can be used as a stopwatch and then reset. 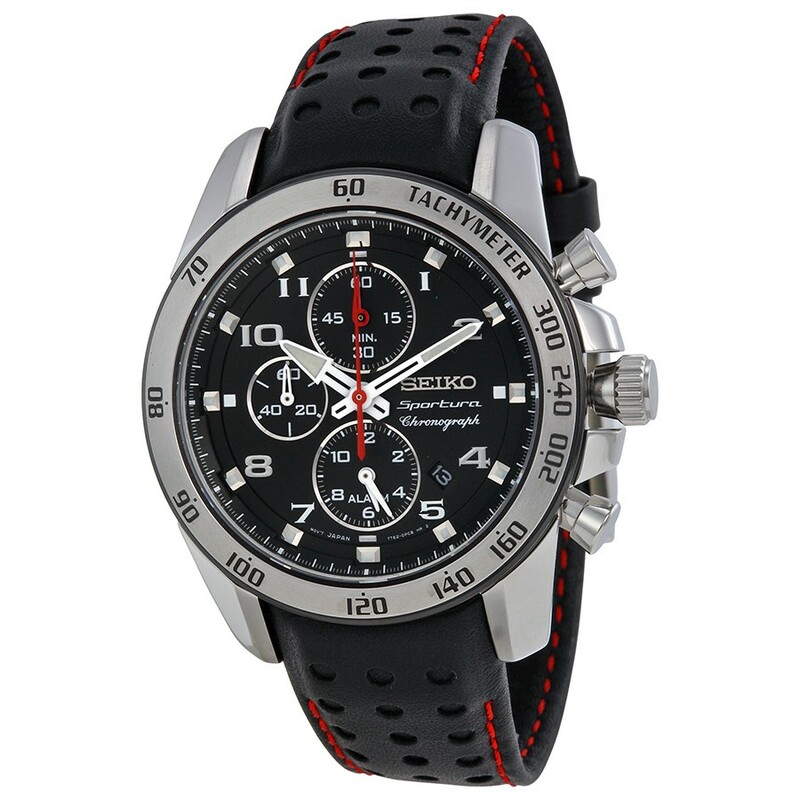 This makes it a great choice for coaches or anyone who wants a nice-looking watch that’s also practical. The Sportura can resist water up to 330ft (100M). It’s ideal for swimming and most other water sports, however, deep sea diving is a no-go because the intense pressure could compromise the product. The case and bezel are made from stainless steel for ultimate durability. This is important to me, because I’m very active and I can’t have a watch that will breakdown on me if I wipe out on my bike or something. Today a lot of people use their phone for their alarm clock. But if you’re a heavy sleeper like me, you’re going to want to have more than one alarm set; this watch makes the perfect backup. The Sportura comes with a tachymeter, which is a pretty cool feature. Basically, what a tachymeter does is calculate travel time by measuring distance based on speed and vice versa. For some, this is just a point of interest, but for other people, they could potentially find this useful in their daily lives if they travel a lot. When I first got my hands on the Seiko Sportura, I was very impressed by the look of it. It has a very clean sporty aesthetic. I like the active look and the black dial, and even though I’m not really knowledgeable about things like stitching, I can tell the band is high quality just by the feel of it. Also, the face is really easy to read, which is always a plus. The Sportura is made with Japanese quartz for ultimate timekeeping ability. The waterproofing is great and more than adequate for most water sports enthusiasts. The stainless-steel case and bezel plus the Hardlex crystal dial window make for durability, and the chronograph functions flawlessly. The leather calfskin band is comfortable and looks great. Also, the contrast stitching makes for a sportier look; I like watches that mix an active look with a daily wear look and this watch does that in a cool way. I also like the fact that Seiko is a well-known brand that’s been around awhile. A watch is an investment and if you’re on a budget, you’re going to want a watch with a good reputation; the Seiko Sportura fits that bill perfectly. The band is made from leather calfskin, so that’s something most vegetarians might not like to hear. However, this isn’t a problem for people who are okay with leather, and most will see this as a good thing. Another thing: The watch isn’t suitable for diving. I’m personally not a diver, so this doesn’t affect me, but it’s worth noting for those who are. Also, worth noting is the fact that most watches—even sports watches—aren’t capable of diving to really deep depths, so this isn’t really that big of a deal on balance. For customer convenience, it comes with its own non-standard battery. This is great for people who aren’t into tracking down the right battery for their watch, which can be a difficult task. 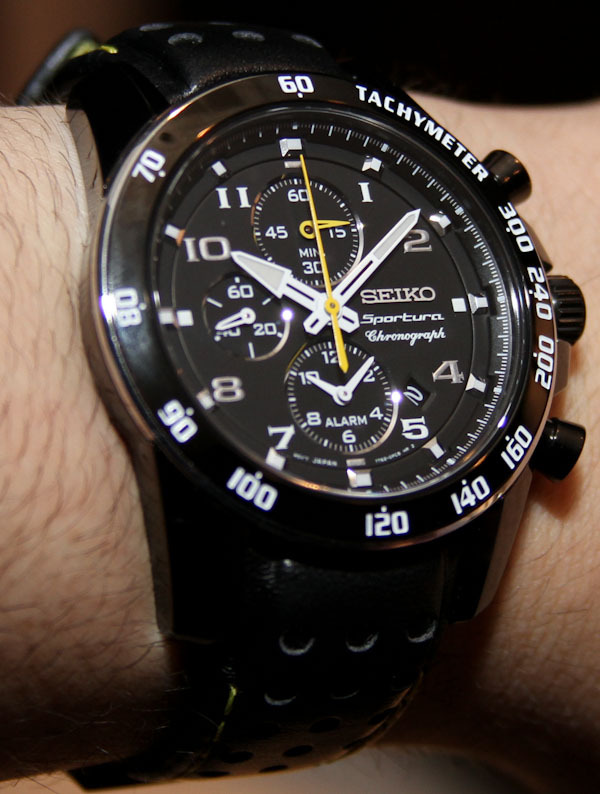 I heartily recommend the Seiko Sportura to anyone who is interested in buying a new watch. With its suave yet active look, it will fit a variety of personal styles. And the durability makes it great for active guys. I’m hard on my watches, and this watch has stood up to the wear and tear amazingly. Also, the more advanced features like the chronograph and tachymeter are actually really easy to get the hang of. You can find this watch with great discount, as it is not a fresh model. All in all, it’s a great watch, pure and simple.